Donated to the Daly House Museum Phyllis Ricou in 1985. 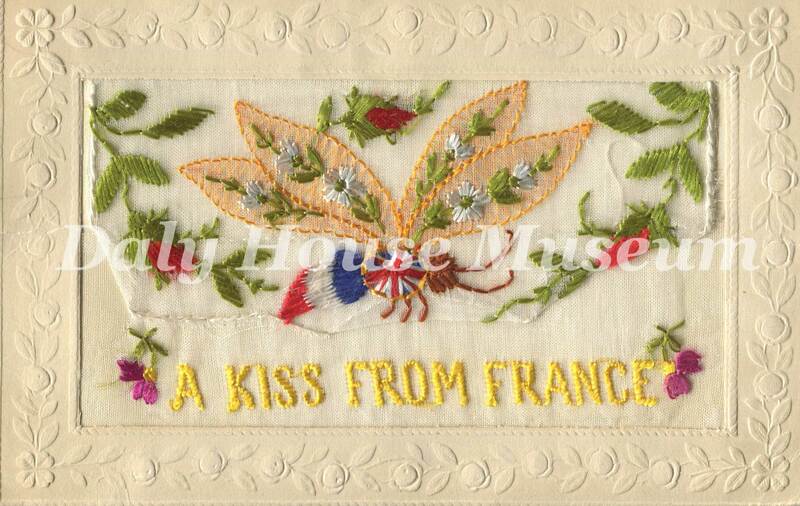 An embroidered postcard sent from France by First World War soldier, Laurie Smith to his niece, Phyllis Ricou (donor). The note is addressed to Phyllis from Uncle Laurie. 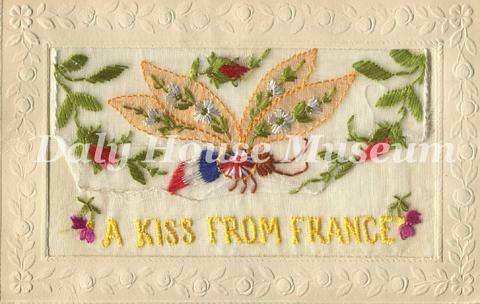 The card was produced in Paris. History: First World War veteran Laurence ("Laurie") Vinton Smith was born in 1891 in Southampton, England and came to Manitoba in 1905. He lived in Franklin and Russell before enlisting with the Canadian Expeditionary Force in Winnipeg, 1916. He fought in France and was awarded the Military Cross for his service. After the war, he returned to Manitoba and settled in Brandon where he worked for Nation & Shewan Ltd. In 1929 he joined the Brandon Sun staff as their advertising manager. Smith retired in 1958 but remained an active member of the community. He was a member of the Army Navy Veterans, the Royal Canadian Legion, the Brandon General Hospital board, the Rotary Club, and St. Mary's Anglican Church. He was also involved with the Boy Scouts, the United Nations Association, the Red Cross, St. John's Ambulance, the YMCA, the Brandon Friendship Centre, and the United Nations Association. Smith passed away in 1974 and is buried at the Brandon Municipal Cemetery. Handwritten note on the back reads: "On active service, France 11/10/17. My dear Phyllis, just another card for you. My but you have grown! Lots of love & kisses. Uncle Laurie."